Divisions between Nova Scotian colleges. Sir James Kempt. Finishing the building. Proposal to unite Dalhousie and King's College, 1823-4. Nova Scotia's Executive Council and Colonial Office pressure for college union. "Like Julius Caesar’s Gaul, Nova Scotia’s college geography in 1821 was divided into three parts, all different. King’s in Windsor had a fine royal charter and a decrepit wooden building; it was also riven by personal feuds rather more damaging than its building. The second, Pictou Academy, had no charter as a college, but had a useful building and great ambitions. The third part was Dalhousie College, with a handsome new (and expensive) stone building right in the middle of Halifax, almost finished, but having neither principal, staff, nor students - nothing in fact except £8,289.9s.6d. invested in London, a growing debt in Halifax, and that fine property on the Grand Parade. "Sir James Kempt knew this only too well. But he was of Lord Dalhousie’s mind, that a metropolitan college in the capital was the best, the only, answer to the potential of a three-way split. Sir James was not perhaps as intellectually vigorous as Dalhousie; the long correspondence between them is like that between the head groundsman and the lord of the manor. Still, Kempt had strengths that Dalhousie had not: he was affable, tractable, sensible, disposed now and then to be disarmingly hypocritical. He thus worked well with local politicians, especially with Simon Bradstreet Robie, the Speaker of the Assembly, whom Lord Dalhousie had sometimes thought of as a low, conniving fellow. Kempt was not a bad hand at conniving himself, when needed. "He was a fifty-five-year-old bachelor, born and raised in Edinburgh, with a fine military record. In Halifax he developed a reputation as rather a gay (in the old-fashioned meaning) blade, disposed to having pretty women around Government House, one of whom was a famous and beautiful grass widow, Mrs. Logan. He was liked for his parties and his vivacity. High-toned he was not. Like his predecessor, Kempt was also a great traveller, but rather more practical, having a penchant for making good roads. The Kempt Road in Halifax marks that proclivity. "Lord Dalhousie remarked from the heights of the Quebec Citadel that in only two respects had the Assembly of Nova Scotia disappointed him. They had secretly opposed his wishes on militia appropriations; and their same “want of candour and honesty” was evident with his new college. What he meant was that the Assembly’s willing acceptance of his initiative in creating the college was followed by a lamentable lack of support for proceeding with it. 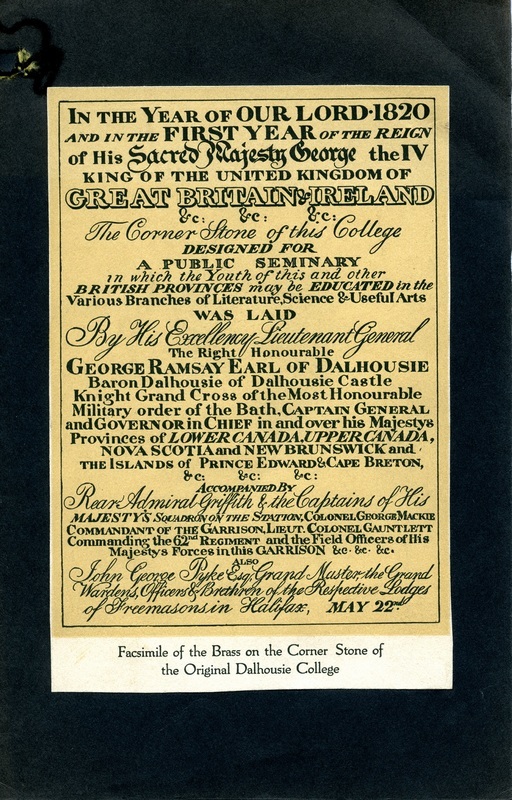 Lord Dalhousie had wanted it to be the college of Nova Scotia, with King’s hived off for that 20 per cent Anglican constituency. The Assembly, riven by its own loyalties, prejudices, and fixations, became difficult, if not impossible, to arouse on the subject of a non-denominational college..."